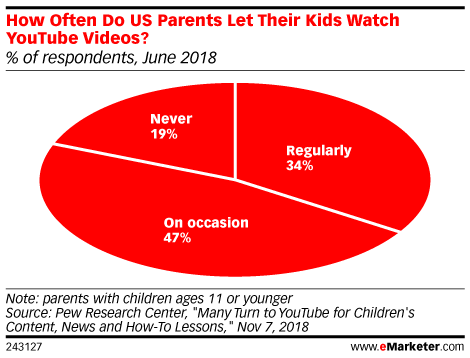 Data is from the November 2018 Pew Research Center report titled "Many Turn to YouTube for Children's Content, News and How-To Lessons." 4,594 US adults ages 18+ from the Pew American Trends Panel (ATP) were surveyed via online during May 29-June 11, 2018. Respondents who did not have internet access were provided with a tablet and a wireless connection. The margin of error is +/-2.4 percentage points.